The site must move from OfficeLive by the end of next month, April. OfficeLive is being replaced by Office365 by Microsoft. MS did not provide an easy migration method, so we're evaluating our options for hosting servers. As soon as that analysis is done, we begin re-construction on the new site. In the meantime, Gardner's Beacon is available at: thomasgardnersociety.club.officelive.com/ (this site will disappear on 05/01/2012). We'll use this post to keep track of progress using the Remarks. 03/11/2019 -- Will be reviewing all of this due to our new thrust: Content management. What's new? Bringing in ecommerce, in the large and in a non-profit mode. So, we'll tweak things. If I were younger, we would roll our own. We might, if there is interest. As in, young folks, here is a chance to start afresh and to show the world a thing or two. 01/18/2019 -- CMS and more, continues. 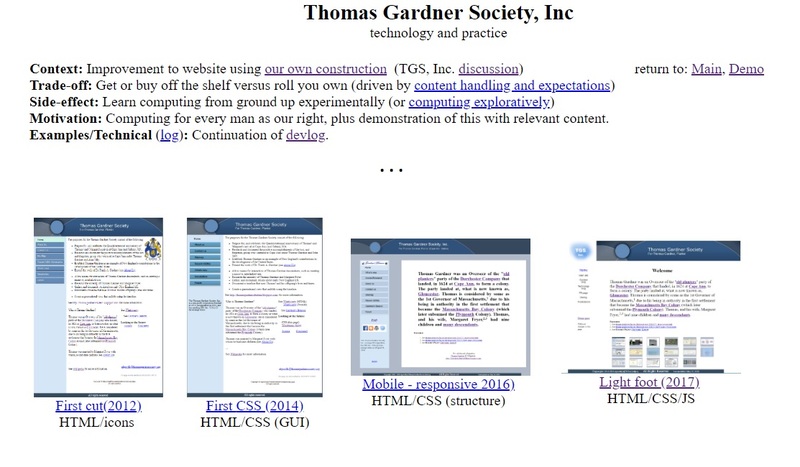 See TGSoc.org which is our new site and the discussion page. 02/11/2015 -- CMS, again and again. 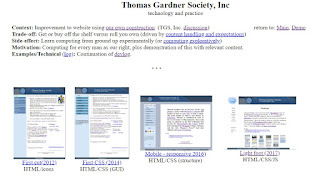 04/18/2012 -- The new site is operative (thomasgardnersociety.org). References that point to 'aspx' will bring up the 404 page which then has a pointer to the new site. Content can then be read as before. 04/17/2012 -- The switch to the new server will occur within the next couple of days. The old site will be there through 04/30/12. 03/22/2012 -- Mostly there, in HTML, will be doing some tweaking. 03/20/2012 -- Figured out how to do pages, using HTML, that look pretty close to what was there on OfficeLive. So, will get that into place soon, as the starter position. Accomplished using SeaMonkey which has a nice WYSIWYG editor (using nested tables). 03/19/2012 -- A good overview of Content Management Systems and a review of the top few: Drupal, Joomla, Wordpress, Mambo. Before, the site used a builder provided by Microsoft OfficeLive. That tool will still be there with Office365, but the costs are going to be much greater which makes the pangs of a transition more palatable. Besides, it's a chance to look at technical issues. 03/19/2012 -- Domain now managed under WebHostingHub, after looking at this matrix and more. Considering, right now, either Drupal or Wordpress to handle the formatting. Taking time to review technical issues. 03/15/2012 -- An overview of the issues ('jewels' and squeezing of such).